Don't look now, but taxes on travel are rising. 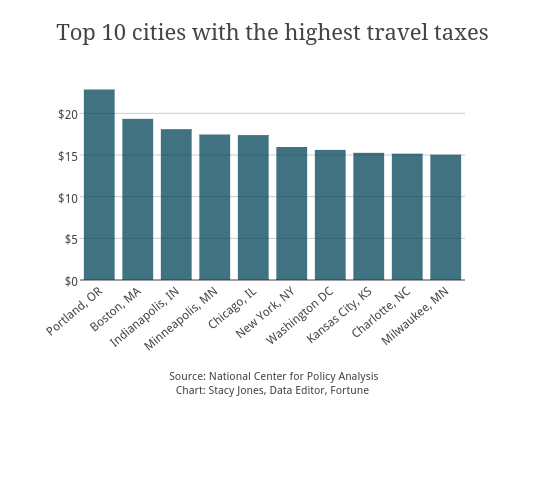 In some cities, visitors shoulder tax burdens that can add 30% to the cost of a trip, and the number is expected to continue to rise, according to a new study by the National Center for Policy Analysis (NCPA). Although many states have anti-tax sentiment, taxes on travel -- including hotel occupancy and rental car fees -- are an increasingly popular way to add to state coffers. Mississippi just passed legislation will allow cities to increase their occupancy and rental car taxes. And Georgia adopted a law to assess a $5 a night room tax to pay for repairing crumbling infrastructure, it noted. 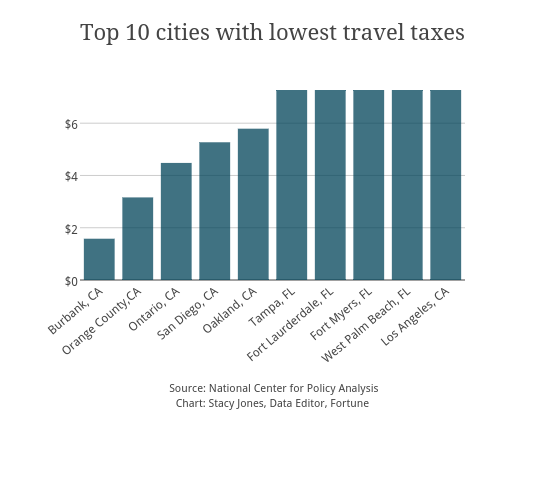 "States and cities raise travel taxes because they are looking for more revenue without raising the taxes that the local electorates hate – sales taxes and property taxes," says NCPA Senior Fellow Pam Villarreal. "It is much easier to tax out-of-towners that are not using city and state services year round and don’t have as much skin in the game." While the study doesn't chart the rise of taxes over time, it does pinpoint the hotspots for travel taxes in the United States. Topping the list is Portland. The average traveler to the City of Roses pays $22 a day in taxes, the research found. It's closely followed by Boston ($19) and Indianapolis ($18). And the lowest areas? That would be Burbank, Calif. ($2), Orange County, Calif. ($3), and Ontario, Calif. ($4). Fees tacked on to airport car rentals and hotels are the main culprits, says Jacob Kohlhepp, a research associate with NCPA. "Renting cars and hotel rooms near the airport is expensive due to extra fees levied by the airport authority," he says. "Travelers should consider renting a car at a location farther away from the airport." About 22 states levy a specific statewide tax on lodging, ranging from as low as 3% to as high as 13% of the price of a night’s stay at a hotel or motel. At last count, 38 states levied a car rental tax. But the tax burden is often higher when the car is rented at an airport, where a surcharge is added by the local airport authority. Taken together, airline taxes can amount to a 30% surcharge on some domestic flights. They include a 7.5% excise tax on every ticket purchased, a segment tax of $3.70 charged per takeoff and landing, and a "September 11 Security Fee," which last year doubled from $2.50 to $5.60 per leg of each flight. Taxes have a negligible effect on airfares, says Villarreal. "Lower fuel costs, more competition and the threat of Department of Justice investigation into airline collusion have more to do with falling ticket prices than anything else," she adds. Cities like New York and Washington are easily explained, says Kohlhepp. Washington, D.C., and no other city has the same iconic attractions as New York," he says. "New York City and D.C. are centers of business and politics. Due to this competitive advantage, they can tax tourists more without fear that tourism will decline so much as to offset the hoped-for increase in revenue." Others, not so much. In Portland, travelers have to deal with steep hotel occupancy taxes that are charged by both the city (6 percent) and the county (5.5 percent). These, plus a 2 percent tax paid by the hotels themselves, means that hotels and travelers share a 13.5 percent effective tax rate, according to the study. Rental car taxes are also 17 percent. "The only saving grace of the city is the lack of a sales tax," says Kohlhepp. High hotel taxes can put a destination at a competitive disadvantage, he notes. The study doesn't cite reasons for the low taxes, but there are obvious benefits. Burbank, for example, is a favorite Southern California airport for frequent travelers, and its numbers have been on the rise, thanks in part to lower travel taxes. Four Florida destinations — Tampa, Fort Lauderdale, Fort Myers and West Palm Beach — also made the low-tax list, which may explain why they're so attractive to travelers, says Kohlhepp. The National Center for Policy Analysis study echoes a 2013 study by the GBTA Foundation, the education and research arm of the Global Business Travel Association which, not surprisingly, found that travel taxes were out of control. High travel taxes remain a huge concern for large corporations and specifically the executives who manage their travel departments and plan meetings. The takeaway? For travelers, choose your destination carefully to avoid burdensome taxes. "If you want to go to New York or D.C. or a particular conference or to see the Washington monument or Times Square, you should definitely go," he says. "But if you just want to see a new place or explore generic fine arts or other attractions, you might consider other less well-known attractions. These places tend to have lower travel taxes, and that can mean saving upwards of $200 on a short trip, or $300 to $400 on longer trips per person."